And, seriously, that’s all you need to know. Clover still lucky, getting poisoned is lucky. Do you feel lucky? : Well, do you? (photo by Martin LaBar on flickr.com)Did you know that some clover is poisonous? And, by “clover,” I mean plain old white clover, and, by “poisonous,” I mean cyanide poisonous. I didn’t know. Before you go ahead and swear off eating clover, though, I should reemphasize the word some. It turn out that clover in colder climates is generally non-poisonous, whereas the same species, when found in warmer regions, is very often poisonous. So, Minnesota readers, go on doing whatever it is you do with clover. Mexico readers, however, should just cut out doing whatever they do with clover. That stuff is dangerous! 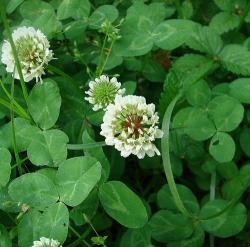 White clover is native to Europe and Asia, and the climate/cyanide presence relationship has long been observed there. Non-poisonous clover was introduced to the Americas about 300 years ago, and has since re-evolved. The precise mechanism for this has been something of a genetic riddle, one that scientists at Washington University in St. Louis are getting close to solving. For a clover to be poisonous, WU scientists have found, two separate genes must be active. A gene labeled “Ac” causes cyanogenic glucoside (sugar with cyanide stuck to it, more or less) to be present in clover cells. The glucoside is harmless, until the second gene, “Li,” comes into play. “Li” codes for a particular enzyme in the cell wall, and when the clover (and therefore the cell wall) is damaged the enzyme is released, and it interacts with the cyanogenic glucoside, causing the cyanide to hydrolyze (that’s bad). Non-poisonous clover, it seems, lacks the “Li” gene. Biologists aren’t sure of the reason for this. One thought is that in colder climates there are generally fewer herbivores, and so clovers can get by without being poisonous. If this is the case, then it would be inefficient for clovers to manufacture the Li enzyme. So they don’t. Another hypothesis is that clovers don’t want to kill themselves. When it frosts (which obviously happens more in colder areas) cell walls in plants can rupture, which would release the cyanide-activating enzyme prematurely, and cause the clovers to die. How about that? While we’re on the subject, let’s talk a little about cyanide. Plenty of cyanide compounds are harmless, and even useful - like gerbils. Hydrogen cyanide and the salts derived from it, however, are bad news. They are the staple of crime fiction and Nazi-officer suicides. Inhalation and ingestion are the worst ways to get the stuff in you, although absorption through the skin is possible as well. 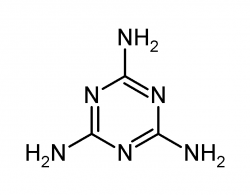 Once in your system, “cyanide ions bind to the iron atom of the enzyme cytochrome c oxidase (also known as aa3) in the fourth complex in the mitochondrial membrane in the mitochondria of cells. This denatures the enzyme, and the final transport of electrons from cytochrome c oxidase to oxygen cannot be completed.” I think what this means is that your blood can still absorb oxygen, but your cells can’t. So, in cases of acute cyanide poisoning, your skin gets pink from the high blood oxygen concentration, and you suffer from seizures, apnea, cardiac arrest, and then death. Plants can generally withstand much higher levels of cyanide than animals, and some, like our white clover or the giant bamboo, are known to contain cyanide compounds naturally. Leprechauns and Golden Bamboo Lemurs feed exclusively on these two plants (respectively), and absorb massive doses of cyanide with no ill effects. Just how this immunity works is not understood, although scientists are hesitant to rule out “magic,” at least in the case of one species. China to execute former drug regulator. Poison found in food and drugs from China. Melamine: poisoned pets In recent months, multiple deaths of people and pets have been blamed on Chinese ingredients. At least 51 people in Panama died after taking medicine containing diethylene glycol falsely labeled as glycerin from China. The same poisonous ingredient was found in toothpaste traced back to China. China was also blamed for 14,000 reports of sickened pets due to tainted pet food. Melamine, a cheap plastic made from oil, and when added to animal feed, looks like protein in tests. “It just saves money if you add melamine scrap,” says a manager of an animal feed factory in China. Melanine in food is illegal in the United States. Sixteen pet deaths linked to melanine led to the recall of 60 million packages of pet food. China needs to improve food and drug regulations. China's former top drug regulator was sentenced to death today for taking bribes to approve substandard medicines, including an antibiotic blamed for at least 10 deaths. Under a nationwide safety campaign launched Monday, 90 administration inspectors will be sent to 15 provinces over the next two weeks. The government also announced plans for its first recall system for unsafe products. Hopefully China will learn that regulating food and drug safety is worth while.